Oil on canvas, 42 x 35,5 cm. In his paintings, Abildgaard primarily worked with figure compositions and the format was often small, as in this picture with a literary subject. It shows the god of love, Cupid, with his beloved, the young mortal woman, Psyche. The painting is not signed and dated, which suggests that the painting was made for private use. The painting belonged to his artist colleague Jens Juel and was probably originally a wedding gift. The stylised expression is typical of painting method Abildgaard practiced around 1790. 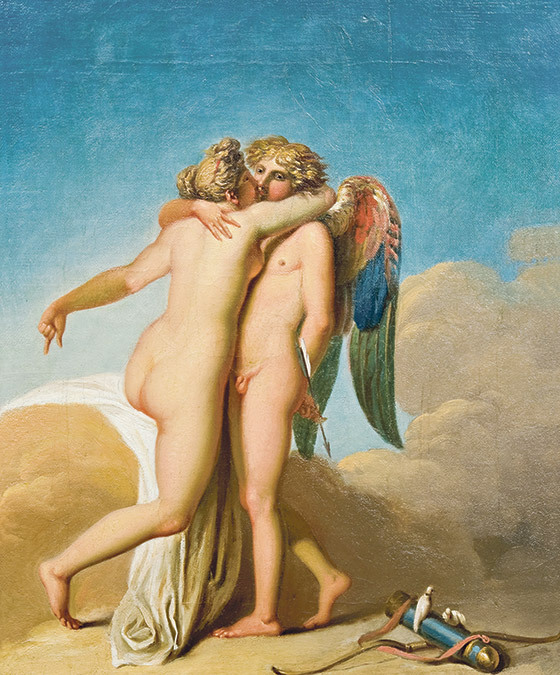 Psyche does not look out at the viewer, but is fully absorbed by Cupid and their embrace. Cupid, on the other hand, looks out at the viewer with a vivid gaze that is both melancholy and dreamy, emphasised formally through the white highlighting of his eyeballs. He is both present and distant in the embrace, split between his heavenly being and his earthly love.